We investigate the recombinative desorption of hydrogen and deuterium from a Ru(0001) surface initiated by femtosecond laser pulses. We adopt a quantum mechanical two-state model including three molecular degrees of freedom to describe the dynamics within the desorption induced by electronic transition (DIET) limit. The energy distributions as well as the state-resolved and ensemble properties of the desorbed molecules are analyzed in detail by using the time-energy method. 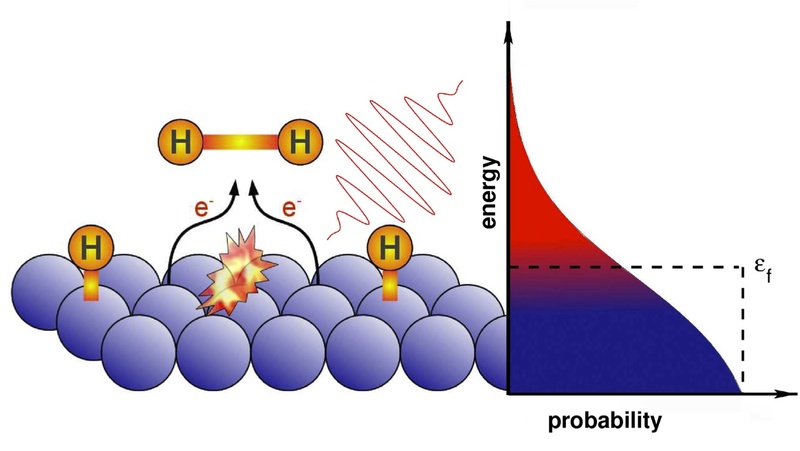 Our results shed light on the experimentally observed 1) large isotopic effects regarding desorption yields and translational energies and 2) the nonequal energy partitioning into internal and translational modes. In particular, it is shown that a single temperature is sufficient to characterize the energy distributions for all degrees of freedom. Further, we confirm that quantization effects play an important role in the determination of the energy partitioning.